Today I’m welcoming Arlee from Small Potatoes who is sharing her tips to survive messy play. Arlee is a pasta loving, cookbook hoarding Mum of six, and a preschool teacher who runs her own in home child care. If you have not yet visited Small Potatoes you are missing out on awesome bento box ideas, kid friendly recipes and loads of great activities for kids – all shared with the most gorgeous photos! If messy play makes you shudder, just keep on reading. Do not avert your eyes and run for cover. I promise you’ll be ok! There is hope for you and I’m here to give it to you. Just stick with me until the end, ok? 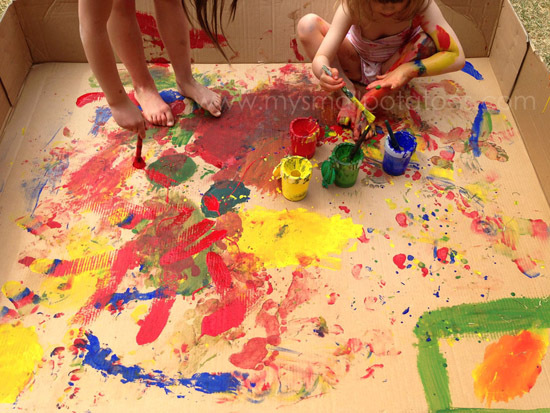 Do not attempt a new messy play activity when you are already in an impatient, cranky, or frustrated state of mind. Making a big mess will do you no good if your mind is already messy. 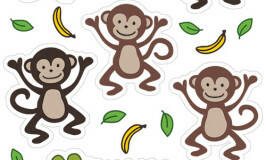 Children need to let go of good sense and conventional boundaries in order to make new discoveries. They will learn how things feel, how materials react when put together, their language skills are enhanced as they verbalize their sensory experiences. Have you ever tried to be creative when someone has you cornered with their rules and thought processes? None of these rules will ever lead to a new idea. Everyone will end up with the same thing in the end, and that’s a bit boring if you ask me. If the activity is set up in a contained area, you are less likely to feel anxiety over the kids ruining something important to you. Your containment device may be the great outdoors, a plastic tub, your ACTUAL bathtub, a plastic bin or bowl, or in this case, a cardboard box. The fewer materials or ingredients you have to your activity, the easier it will be for you to clean up. In this activity, I used 4 colours of tempera paint made with baby shampoo, 4 brushes, 4 pots, and a cardboard box. The paint is mixed with baby shampoo for easy clean-up, and to prevent any stinging eyes if the paint gets rubbed off on their faces. 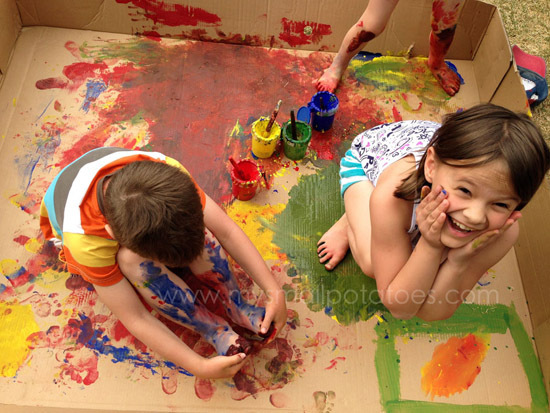 A giant cardboard box is not necessary…if you have a smaller one with taller sides, a child can reach in to paint, or sit right in the box and have just as much fun. 1. You can paint on the box or on yourself. 2. You can paint your legs up to your knees, your arms up to your elbows, and you may not paint on your face or anyone else’s. 3. You need to wash in the washtub upon leaving the box. And that was it. If any of the rules were disregarded, the child would get a warning. If the same rule was once again broken, the child would have to leave the activity. They loved the activity and stayed within the boundaries I had provided and no one had to miss out on the fun. If you are playing inside, provide a big bowl of water and a towel close by on a plastic sheet. This way, the children can easily move from the activity to clean up without dripping their way down the hall to the bathroom. I keep a washtub on a pallet in my backyard that is big enough for the smalls to stand in. There are also towels hanging on my fence. I rarely have to get involved in the clean-up of their little selves. They do it all themselves. It’s really quite satisfying to watch my children enjoying themselves in the creative process of messy play. Colours swirling together, conversations oozing with adjectives and exclamations, eyes widening with discovery, and the giggling…oh the giggling. 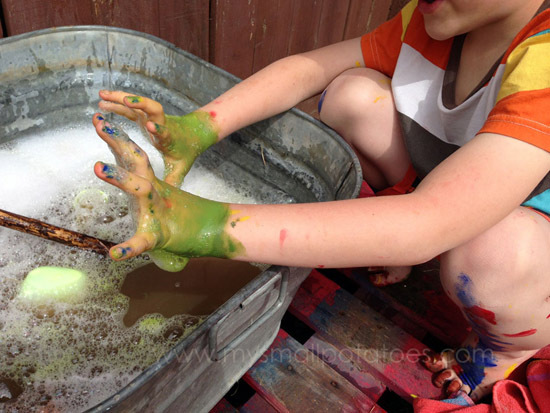 Messy play shouldn’t be a big chore or an anxiety booster. If you are prepared and keep to your simple rules, it will open your mind to a whole world of creativity you never knew was there. Messy play is good medicine. I’m so pleased to have had Arlee sharing with us today, please leave her a comment and share what you love and hate about messy play. You can find Arlee on her blog Small Potatoes, on Facebook, twitter, instagram and pinterest. OK … LOVE the idea of having a wash-up station nearby the play area. 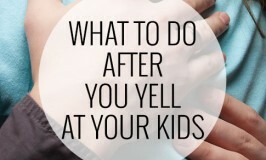 I’ve been trying to figure out a way to get my kids to be more self-reliant in their messy play clean up & this is a great solution. I love the idea of setting the ground rules first, I always forget to do that and live to regret it. I do love messy play, but shy away from it more now that I have a bub on the scene. Thanks for these great tips. I think it would be even more fun for us all if I had a big warm water wash up station near the back door to avoid the at-times stressy march to the bathroom at the end. I will def give this a go. I love this! 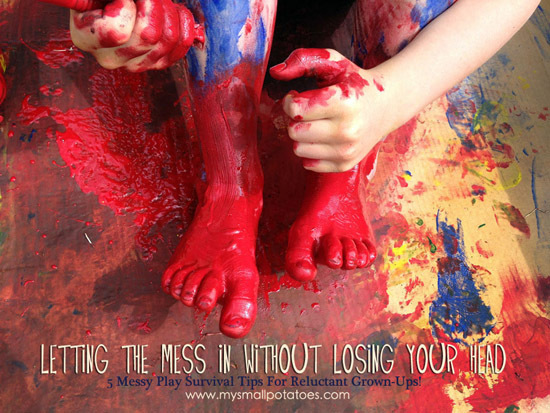 I know messy play is important, but I Do Not Love It. Usually when I let the kids paint, it’s on the kitchen table, with large sheets of paper taped over it and smaller paper to paint on. But both my girls love to paint themselves, which just doesn’t work well in that space. The next warmish Saturday afternoon that we have, I am going to set them up outside with a big cardboard space. We don’t have a big box like that, but we do have a bunch of folded down moving boxes I could lie out for them to work on. But Arlee, with all the paint on the bottom of the box, how did you get them not to sit in it and end up with paint on their clothes? This is terrific. 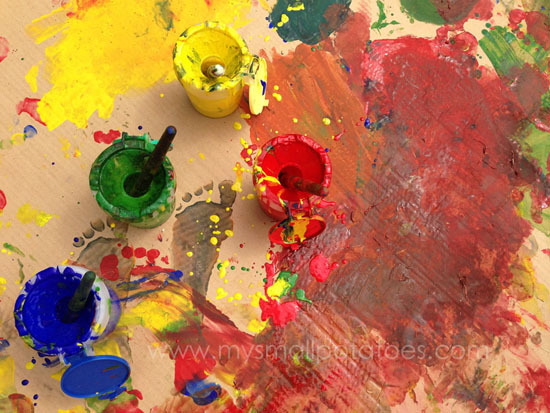 Messy activities are so important for children, and lots of parents and teachers (for instance, me) just aren’t that into them. Figuring out ways for adults to get more comfortable is good for kids. love the idea of having wash up place nearby the play area…. thanks for the inspiration (^_^) love it so much. your blog is super cool! Some great ideas here for mess-with-boundaries! I’m all inspired and looking forward to seeing what the kids come up with. Thank you!